Quality roof repairs or replacement are critical, and should not be performed by just any person who calls themselves a roofer. You need someone who is experienced and who has the training and skill to work on your particular type of roof, including the pitch type and the materials. Otherwise, you run the risk of getting shoddy work performed so that you have to pay for expensive repairs or an early roof replacement a few years down the road. Worse, you could end up hiring someone who takes your money without performing the work. There are many scammers out there calling themselves roofers, so finding the right North Phoenix roofing company, or Phoenix roof repair contractor in 85027 is essential to your roof’s longevity. On many review sites, people are given the option to leave a star rating as well as comments. Even if people have relatively positive or even neutral comments, they may leave an overall low star rating based on aspects of their experience that they did not specify. The same is true for if they leave comments that seem somewhat negative but they had an overall positive experience. The average star rating shows the overall type of experience from all customers. Even if you see some really egregious comments, if the roofer has an overall positive rating, you can feel confident that the bad review was an exception. The same is true if you see some great comments but the roofer has an overall negative rating. You may see some low star ratings and feel concerned. But if you look at the comments, you may see that the customer had an issue with an insurance problem that was conveyed to the roofer, or you may see that the issue was a matter of a personality difference, not a problem with the work. Reading the comments lets you know if people are having a problem with the service or the workmanship, which are the most important aspects of rating a professional. Only by reading the comments can you know what to truly expect from working with a certain roofing professional. Some sites will even let you contact the member for more information or to pose a follow-up question asking for more details. The Better Business Bureau, the Arizona Register of Contractors, and the Ripoff Report all let people file complaints about roofers. These complaints go far beyond a poor customer service experience; they are primarily about serious legal issues or violations of professional ethics. If you see a complaint on one of these sites, it’s a good indication that you should probably keep searching for another roofer. However, you should take all the information into account to know for sure. Sites like Houzzz and Angie’s List have forums that let you ask for recommendations. After reading the reviews on these sites and others, you can go to the forums and ask specifically for recommendations for roofers that specialize in the type of work you need performed. If you see reviews for some of the roofers you are considering, you can post to the forums to ask for more information or to ask specific questions about details you didn’t see mentioned in the reviews. Look at as many review sites as you can when researching a potential roofer. Some possible sites include Yelp, Angie’s List, Home Advisor, BBB, Houzz, Arizona ROC, and Google Reviews. Read the information carefully, and take all aspects of the reviews into consideration. 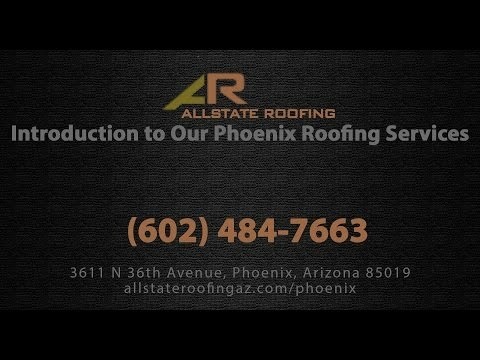 Allstate Roofing Inc. is a trusted roofer in Arizona with a well-established reputation. If you check out our online reviews, you’ll see that we have many customers who were happy with our work and our service. Qualified to handle Phoenix tile roofs, Phoenix shingle roofs in 85021, and more, our experienced roofers work on residential and commercial roofing systems, and they perform both Phoenix roof repairs and Phoenix re-roofing. Call us today or contact us online to get a free estimate for your roofing work. We service customers throughout Arizona.